Cakes usually rise more in the middle, creating a dome to the cake. Cracking is also a problem for some bakers. While you can cut off the domed, cracked area of the cake, steps you take during the mixing and preparation phase reduce or eliminate the concern. A little experimentation with cake baking helps you understand the subtle difference in your own oven that affects how cakes bake and rise. The adjustments you make produce a delicious cake without a dome on top. Measure the temperature of your oven with an oven thermometer to make sure it heats accurately. Measure the temperature in different areas to see if it heats evenly. An oven that is too hot makes the cake dome faster and crack. Heat the oven to 325 degrees F. Most cake mixes and recipes recommend 350 degrees, but the lower temperature prevents the cake from rising rapidly and cracking. Measure the ingredients as indicated in the recipe or on the cake mix box. Improper amounts or throwing off the ratio of ingredients affects how the cake bakes and may cause a high center or cracking. Mix the ingredients according to the directions. Avoid over-mixing, which introduces extra air that may contribute to cracking and doming. 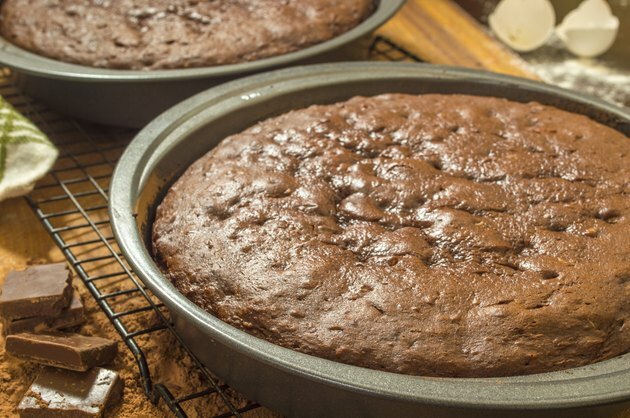 Tap the filled cake pan gently on the counter before baking to help release air bubbles trapped in the batter. Place special baking strips around the pan that help the cake bake more evenly. The strips are available at craft and specialty stores that sell cake-decorating equipment. Spray a flower nail with cooking spray. Press it into the middle of the cake batter with the large, flat side down toward the bottom of the cake pan, until it touches the pan. This is particularly helpful in larger cakes because the nail conducts heat to the middle of the cake to bake it evenly, preventing the edges from cracking before the center is done. Remove the flower nail after you remove the cake from the pan. Leave at least an inch between pans if you bake more than one cake at a time. Touching pans can cause uneven baking, increasing the chances of cracked or domed cakes. Watch the cake closely as the baking time nears the end. Over-baking the cake increases the risk of cracking. Avoid opening the oven door prematurely. If you open the door too early, it may cause the cake to fall and create the opposite problem. If the cake rises in the middle, lay a clean towel on the cake and push down gently as soon as you remove the cake from the oven. Continue pressing on the high area to flatten it. Bake Decorate Celebrate: Ask Nancy: How Do I Keep My Cake From Cracking As It Bakes?